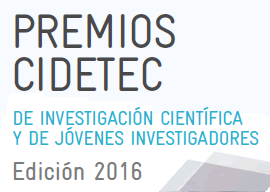 The CIDETEC Awards are intended to promote scientific study, technological development and industrial innovation in all types of electrochemical technologies. arch modality and € 2,000 for the young researchers modality. The Jury's decission will be published on April 30, 2017 and the awards will coincide with the celebration of the XXXVIII Meeting of the Group of Electrochemistry of the RSEQ to be held in Vitoria-Gasteiz during the month of July 2017.